Kiss are one of the biggest bands of all time, but you might not know everything about them. They’ve been one of the world’s biggest groups for generations, influential across a huge range of genres and media. Over such a long, colourful career, there have been so many crazy events that it’s impossible to keep up with them all. Here, we present 20 lesser-known Kiss facts. For 10 years, the true faces of Kiss were a secret. They’d teased fans with 1980’s false-alarm Unmasked album, but when the real unmasking aired on MTV in September 1983, it was a huge deal, attracting sufficient attention to rejuvenate the band’s career. And yet, the classic lineup had already been hoodwinked into posing for group shots sans greasepaint in 1974 by Charlie Auringer, art director at legendary rock magazine Creem. Charlie’s cunning ruse was to tell the band he’d spoken to their management and they’d said it was OK… but he hadn’t and it wasn’t. Creem agreed not to publish the shots, to preserve the carefully wrought mystique. Actress Katey Sagal – best known as Gemma from Sons Of Anarchy, Peg Bundy from sitcom Married… With Children and the voice of Leela in Futurama – was an aspiring singer and waitress when Kiss walked into her restaurant in the mid-70s. “Gene thought I was kinda cute, so we ended up kinda going out,” she recalls. Katey’s own band, The Group With No Name, were signed to Casablanca Records in 1976 after Gene pulled some strings. The Group… didn’t last long, but Katey went on to sing back-up for Bob Dylan, Bette Midler and Molly Hatchet before finding fame on TV. The Kiss Kasket was just the start. As part of the deal they signed with memorials firm Eternal Image, a range of Kiss cremation urns are now on the market. The first design depicts the band leaping out of flames, but if you want a more subtle Kiss urn, three further designs are promised. The deal also included the production of Kiss bronze memorials, Kiss prayer cards, Kiss registry books, Kiss memorial candles and Kiss cremation urns for pets. In the 2002 Halloween episode of What’s New Scooby Doo?, Shaggy and Scooby are excited to hear that Kiss are going to be playing a show in town. However, the concert is disrupted by the ghost of Hank Banning (or is it?) and some robot scarecrows. When the faux-spectral mayhem kicks off while the band are rocking through Shout It Out Loud, Gene asks Paul what they should do next. “What we always do,” shrieks the Starchild. “Keep playing till the cops come!” In 2015, they teamed up again for the straight-to-DVD movie Scooby-Doo! and Kiss: Rock and Roll Mystery. In 1977, a year before the Van Halen debut, Gene invited Eddie and Alex Van Halen to accompany him on demo material for Love Gun. On the album, Gene got Ace to play the Christine Sixteen solo note-for-note how Eddie had jammed it. When Ace left the band in 1982, Eddie – by then a superstar in his own right – announced to Gene that he was sick of Van Halen’s new direction and Dave Lee Roth’s ego and he wanted to join Kiss. Gene talked him out of it, insisting Eddie “cast too much of a shadow to be the guitar player in Kiss”. Kiss’s first ‘official’ concert was New Year’s Eve 1973, supporting Blue Öyster Cult and The Stooges. They had a new record contract and management deal, a debut in the can, a brand new logo backdrop and a new stunt: Gene breathing fire, a trick he learnt from the magician Amaze-O. Gene soon found out why Amaze-O was bald when the inaugural fire-breathing event went wrong and Gene’s hair caught fire. The Demon was consoled backstage by ‘70s superstars Todd Rundgren and Rick Derringer, who warned him against playing with fire. Gene took no notice, going on to ignite his barnet many more times over his career. “A must-have for all Kiss fans,” Tommy Thayer has the audacity to say in the advert for the appropriately titled Monster Book, which is an impractically enormous compendium of live snaps of the band that’s limited to only 1,000 copies. This is a ridiculously huge tome that opens up to a width of five feet. “You can get a couple of them and build a house,” reckons Paul, and let’s face it, you’ll probably need somewhere new to live after you’ve shelled out a few grand for a book. A novelty marketing campaign for Gene’s reality show Family Jewels involved the USA-wide distribution of urinal cakes featuring an image of Gene’s face with a urine-activated talking splash protector. Over-zealous Kiss fans were reported to be stealing the items, to which Gene advised, “Remember to wash ’em before you take ’em home.” It’s uncertain what the talking urinal cakes actually said. “You wanted the littlest, you got the littlest!” Mini Kiss were formed in New York City in 1996 by lifelong Kiss fan and 4’4” Mini-Demon Joey Fatale. At their first public appearance, the venue was mobbed to such an extent that police had to be called. In 2004 they toured with A Perfect Circle, and in 2010 Mini Kiss starred alongside the full-sized Kiss in a Dr Pepper Superbowl advert. Sadly Joey died in 2011 but Mini Kiss live on, appearing with Mini Elvis and Mini Gaga at the 2012 Minipalooza Festival. In 1975, college American football team the Cadillac High Vikings were despondent – until coach Jim Neff started playing Kiss albums in the team bus and locker rooms. By the end of the season they had won seven games in a row and ended up Conference champions! 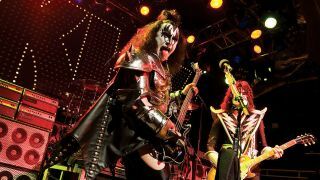 Neff contacted Kiss’s management to tell them of his team’s success, whereupon Kiss offered to play a show on campus and take part in the town’s Homecoming Parade. Originally published in Metal Hammer issue 238.